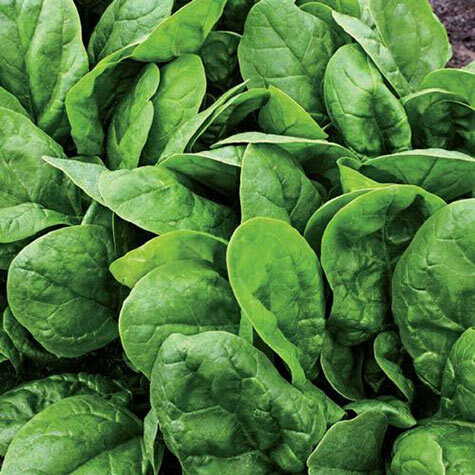 Alexandra Hybrid Spinach | Gurney's Seed & Nursery Co. Bred for use as baby leaf. Fast-growing baby leaf variety with high bolt resistance. It has an upright growth habit that is highly desirable for baby leaf varieties. Make succession sowings every 10 days to extend the harvest period for fresh salad use. Resistant to Downy Mildew. Seed to baby leaf harvest in 3 weeks! 20-25 DAYS. Seed Counts: 1,200 seeds sows a 100-ft. row. Spacing: 1-2 inches apart in rows 12 inches apart. Foliage: Uniform, dark green, smooth, spade-shaped leaves. Pruning: Harvest at both full size and baby leaf stage. Comments: Fast-growing baby leaf variety with high bolt resistance. It has an upright growth habit that is highly desirable for baby leaf varieties. Make succession sowings every 10 days to extend the harvest period for fresh salad use. Resistant to Downy Mildew.